Change is the only constant with unified communications and collaboration (UCC). Whether it's new application integration, a move to the cloud, extension into the contact center, or adding emerging apps, IT leaders are regularly adjusting their UCC strategy. Those changes are keeping UCC budgets healthy and growing. In Nemertes' latest Unified Communications and Collaboration Total Cost of Ownership study, we found 46.2% of companies are increasing their IT budgets by an average of 18%. By comparison, only 6% are decreasing their budgets (by an average of 22%). Large organizations (2,501-10,000 employees) are the most likely to increase spending, while small companies (less than 250 employees) are least likely. Because UCC continues to grow and affect employees, customers, and processes, chief financial officers have renewed their efforts to evaluate operational cost as IT leaders contemplate shifting architectures, changing providers, or adding new integrations. What are the latest trends in UCC costs? We interviewed or surveyed 653 organizations in 12 countries to gather costs, drivers, architectures, and associated data. Perhaps the most significant decision facing IT leaders relates to architecture. This year, we found the largest percentage of organizations to have a hybrid architecture (38%), followed by on-premises (33%) and cloud (29%). Most of the organizations with hybrid architectures are large companies that are either on their way to full cloud -- and expect it to take several years -- or that plan to stay hybrid intentionally. As our research has shown for four years, a move to the cloud usually does not result in cost savings, and IT leaders are starting to realize this (see "Cloud UCC Cost-Savings Fallacy: What You Need to Know"). Indeed, the top driver to the cloud is improved agility, according to our data. This is the first year that "perceived cost savings" was not the top cloud driver. It dropped to No. 3, with only 33.1% of research participants citing it (down from 49% last year). Only 17.9% of companies actually decreased their costs in the first year of cloud service, while 35.6% actually increased costs. However, in subsequent years as integrations were completed and maintenance contracts expired, 27.9% of companies decreased costs, while 24.1% increased. In both cases, the largest percentage said their costs stayed flat. 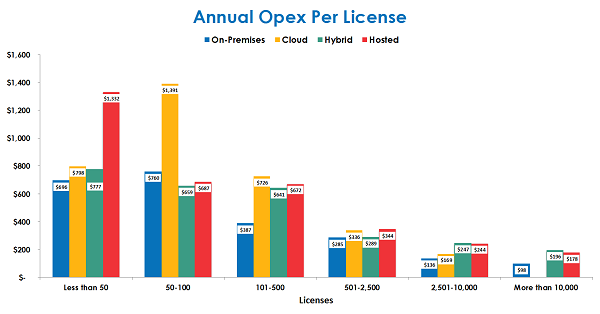 Cloud cost increases are driven by monthly licenses, staff for training and integration, increased network costs, and managed/professional services. Cost decreases were largely driven by equipment maintenance reduction, and to a lesser extent, staff decreases. Another decision IT leaders revisit regularly is whether to adopt a single- or multi-vendor strategy. Most said they preferred a single-vendor strategy because of its simplicity--it reduced costs by eliminating the need for integration, along with training and certification. Our research backed that up: Those who used a single vendor spent from 25% to 41% less on ongoing operational costs than those with multiple vendors. The research evaluates operational costs, and is normalized by number of licenses, so smaller rollouts will have a higher cost per license because there are fewer licenses. Average operational costs are displayed in the figure below, and include four types: all on-premises, cloud (UCaaS, shared server), hybrid (combination of on-premises and either cloud or hosted), and hosted (cloud, single server). Though it's straight-forward for companies to gather cloud subscription costs for each provider under consideration, they do not always know how the other costs will differentiate between vendors. Our research gathers real-world data, by vendor, so IT decision-makers can use it to help make cost-based decisions. In fact, Nemertes created an interactive tool to provide companies with costs that align with their rollouts. Though many factors come into play to determine exact costs for each company, these provide good indicators of which providers are generating the best value for organizations.